In spite of his repeated public insistence that he opposes Ex-Im, it was McConnell who introduced (for Senator Kirk) the amendment to revive the bank via the unrelated highway funding bill, knowing full well that it had the votes to pass. 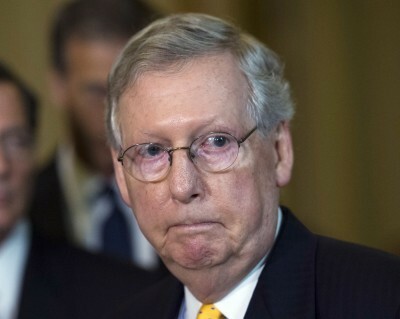 As Senator Cruz pointed out in his brilliantly scathing speech, the Senate Majority Leader has priority of precedence on the Senate floor - meaning that only McConnell could guarantee a vote on Ex-Im. Conversely, McConnell alone could have guaranteed Ex-Im stayed expired, by simply refusing to give it a chance on the floor. But instead McConnell lied, and the amendment to reauthorize an 80-year-old corporate welfare fund received a vote. 24 Republicans joined the Democrats to pass the amendment. Ever the crafty politician, McConnell voted against the amendment, having already done his share to ensure it passed. Don't think you got my point. ALL countries do exactly the same thing for their large companies. If we stopped the other countries would simply buy from foreign companies who get that financing. Guess what happens when we sell large purchase items such as planes overseas? That provides jobs and money. Doesn't take a genius to figure that out. Besides- I doubt the sincerity of republicans and their tea party affliates with their so-called concerns over corporate welfare since they support citizens united- a HUGE handout to corporations as well as the billions we give energy companies every year. Not a peep from the GOP or the tea party on either of those much larger instances of corporate handouts. I wrote Senator Heller (NV) this morning to protest his vote for this, and the underhanded way they are trying to get the ex-im passed. Also, Representative Amodei, to request he stand against this bill, and this way of doing business. I asked both of them if they heard and understand what Rush said yesterday about the Republicans, and Senator Cruz said last week. If Boeing wants access to those markets, let Boeing pay for it. Tax payers should not be subsidizing huge corporations so they can provide campaign contributions to suits in the Senate. Perhaps the Senate should focus on passing less toxic trade agreements that don't require propping up with U.S. tax payer money. Ok. As a conservative I would like the figures on the loans made from import - export . I want to see what the rate of return is. Typical not to give facts or figures on what import - export bank loans generate or the failure of these loans. Let's quit the talking points and provide some hard facts which is normally missing when people comment. Let's audit the import- export banks transactions. The. We can determine if it's beneficial to the public or not. I assume most conservatives and the general public for that matter have a clue what the import-export bank is and what it does. Simply put the law enables large US firms to do business with foreign companies by getting the companies whom buy said products ideal loan financing. This goes for large purchase items such as commercial telecommunication equipment, Aerospace such as commercial aircraft and jet engines, large construction equipment as well as big construction projects. Without this form of financing the competitiveness of these US firms would fall when compared to the other developed, industrialized countries who do the SAME thing as we do. So as much as I'm guessing the T-Party wants to proclaim this is government welfare, this is one of the many issues where ideological rhetoric gets in the way of common sense. And hence why this-along with the ACA are perfect examples of why the tea party is rapidly becoming a has-been.